What is the Deadline for Contesting a Will in Florida? According to surveys completed by AARP, an astounding 60 percent or so of adults in the United States don’t have an estate plan or will in place. While most of us know that we need to have a will, we have a tendency to have the mindset of “I can do it later.” Waiting until later can be catastrophic, because none of us know when our time will come to an end. 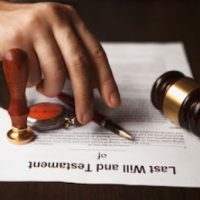 If someone realizes there is an issue with a will, however, what does that person have to do and how much time do they have to challenge that will? Like other legal actions, challenging a will has a statute of limitations, or time frame for taking legal action. In the state of Florida, the time limit to challenge a will is only three months. You may have heard the statute of limitations allows for years to file other types of claims, but that is not the case for contesting a will. Statutes specifically state that anyone interested that has had a notice of administration served must object to the will, jurisdiction, or venue by filing a pleading or petition requesting relief based on the rules of Florida probate on or before three months from the date of service of the copy of the notice of administration. Failure to file within the three-month period will prevent later objections from being filed. As you can see, once a person is serviced with a notice of the administration of the will, the clock starts ticking immediately. The notice of administration is a court document served by the court that notifies interested parties that the will is going to be taken to probate. An interested person is anyone that could be reasonably affected by the will’s outcome. The only exception that Florida allows for the statute of limitations is if a misstatement is made by a personal representative regarding the time period. If this happens, an objection must be filed. If you have been placed in a situation where you feel like you need to challenge a will or estate plan of a loved one, you need to contact an experienced attorney as quickly as possible. It is very easy to let time run out, and you don’t want that to happen. Tampa attorney David Toback has years of experience helping people with all aspects of will and estate planning and is ready and willing to assist you with all of your legal needs. Contact his office today to schedule a consultation.